We know him as a Laughing Buddha or Happy Buddha. He is usually shown smiling or laughing, hence his nickname the Laughing Buddha. He is also called as the "Happy Man"
His large protruding stomach and jolly smile have given him a common designation ‘Laughing Buddha’. The Laughing Buddha is not the same as Siddhartha Gautama. an Indian prince who became the founder of Buddhism in 520 B.C.E. Laughing Buddha and Siddartha Gautama both are different persons. Laughing Buddha the character is thought to be based on an historical Chinese Buddhist monk who lived more than 1,000 years ago. The celestial Buddha named Hotei or Pu-Tai is best known as the jolly Laughing Buddha. In China, he is known as the loving or friendly one. He is based on an eccentric Chinese Ch’an (Zen) monk who lived over 1,000 years and has become a significant part of Buddhist and Shinto culture. Because of this monk’s kind and generous nature, he came to be regarded as an incarnation of Bodhisttava who will be Maitreya (the future Buddha). According to a legend, if one rubs the belly of Laughing Buddha, it brings forth wealth, good luck, and prosperity. The kind and generous Buddha is also regarded as deity of abundance and contentment. It is also believed that the Laughing Buddha can absorb negative energy and emanate positive energy. 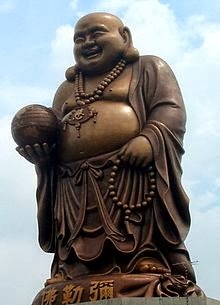 Budai or Pu-Tai or Hotei in Japanese, Bo Ð?i in Vietnamese, is a Chinese folkloric deity. His name means "Cloth Sack and comes from the bag that he is conventionally depicted as carrying. Laughing Buddha may be found sitting on a cart drawn by boys, or wielding a fan called an oogi (said to be a "wish giving). All of these images display Hotei as a wandering monk who goes around and takes the sadness from people of this world. He is incorporated in Buddhist, Taoist, and Shinto traditions. He was truly a great Zen master and legend has a great story, which is so inspirational for all of us. he was used to go from one place to the other. He was so funny looking and always smiling that people used to crowd around him. He would then distribute sweets and small toys to all children who had gathered around him. Then keep his bag down, look to the sky and just start laughing. He used to laugh freely without bothering about presence of others and he was not interested whether other laughed or not. Soon his laughter used to be contagious and all who had gathered would start to laugh. The whole town used to laugh and laugh. After sometime he would pick the bag, which he had kept down, smile to all, and go to the next town. All his life he did only this action and it was said that many people attained Nirvana, enlightenment just through this process. Hence he was called as the laughing Buddha because Buddha is someone who is enlightened and laughter was his unique method. He would rarely speak and once when he was asked to describe his method he told, that he gave sweets to children to symbolically that the more you give, the more comes to you. Thereby he unveiled the secret of "Giving with joy". The bag represented problems that all humans encounter. The problems appear big because we are associated with it- calling it as "My Problem". Look at a funny phenomenon, if anyone comes to you with any problem of theirs and seek solutions or advice, what you do. You tell them so many solutions so easily as though you are an expert in all the fields in the Universe. But then what happens to your own problems. This happens only because of your attachment and association with the problem. "Separate form it" and yes just Laugh. What else can one do? Think and thank nature that you only have such a small problem as compared to so many others. Whether you laugh or cry the problem is going to be there right. So why not laugh at it. apply it to realize about the power of laughter. The problem now looks too tiny and as you pick it (symbolically he picks back the bag before going to the next place) the problem is solved. On laughing our whole internal chemistry changes and thereby the body produces certain enzymes that are only released in a state of laughter. Whole life Hotei lived in Laughter. And when the time came to pass away, he knew he had to give up his life at an appropriate time. He called his disciples and said that after he passes away, they should immediately burn his body. The disciples were surprised because there was no tradition of burning in Zen. But they followed the master wishes. And as they lit fire to his body, "Fire Works and Crackers" started flying all over. Hotei was so great that just before he died he hid a lot of crackers and rockets in his clothes. So there also he created such laughter by the suddenness of the situation. So Hotei not only lived in laughter all through his life, he also died in laughter. some women supposedly rub the Buddha’s stomach in the hopes becoming pregnant soon. In authentic Buddhism, Maitreya Buddha is the "future Buddha," the one who will come in the distant future to revive Buddhist teachings and bring an end of suffering. Why laughing Buddha so happy? Because he is tolerant of everything and will not hold a grudge against anyone. Why does laughing Buddha represent prosperity? Because his big heart gives generously and therefore receives abundantly as well. give without any expectations of returns or recognition before you can be ready to receive the bounties that life has to offer. Tao represented by laughing Buddha says you have to start giving first and expect absolutely nothing. In all likelihood you still will not hit the next jackpot, but you will, with unconditional certainly, win the grand prize of life. 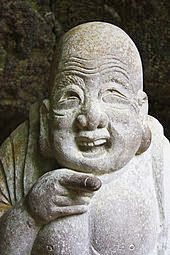 It is said that when Hotei attained enlightenment he started laughing. He lived at least thirty years afterwards; he continued laughing for thirty years. Even in sleep his disciples would hear him giggling. he would go from one town to another just laughing. He would stand in one marketplace, then in another, just laughing, and people would gather. His laughter had something of the beyond - Buddha's laughter. His laughter was so contagious that whosoever heard it would start laughing. Soon the whole marketplace would be laughing; crowds would gather and laugh and they would ask him, "Just give us a few instructions." He would say, "Nothing more, this is enough. If you can laugh, if you can laugh totally, it is meditation." It is said many people became enlightened through Hotei' s laughter. That was his only meditation: to laugh and help people laugh. Just watch life, and you will be surprised. According to Feng Shui theory, for instance, the ideal placement for the Laughing Buddha statue in our home is directly opposite the main door in the living room. This way, the Buddha will be the first thing a person sees as he enters his house. Laughing Buddha should be positioned on an elevated surface, since placing it directly on the ground would be considered a sign of disrespect. he gave all of us, the power of laughter. Gautama Buddha, also known as Siddhārtha Gautama, Shakyamuni, or simply the Buddha, was a sage. According to the Buddhist tradition, Gautama was born in Lumbini, nowadays in modern-day Nepal, and raised in the Shakya capital of Kapilvastu, which may have been in either present day Tilaurakot, Nepal or Piprahwa, India. He obtained his enlightenment in Bodh Gaya, gave his first sermon in Sarnath, and died in Kushinagar. who lived in China during the Later Liang (907–923 AD). Basically they are two different people, one is born and died and one will again born in future. My Boss presented me a laughing Buddha and my suffering started day one .I had to leave my office taking transfer with in six months in 2005 weeping! Thank you for this post as I wanted to know about laughing Buddha.I was thinking that it was lau.Budda not Buddha.Anyhow a much wanted info. Excellent article SM. I am sharing this on my blog. Well, the admin needs to do a genuine research. Siddhartha Gautama aka Gautama Buddha was from Nepal, and a Nepali Prince, not Indian. My son burst out laughing during monks singing, and made The Dalai Lama giggle. I always smile when I think of this. At first I was appalled, but His Holiness the Dalai Lama laughed so I now see it as possibly auspicious. Certainly sweet. in this article There is written that buddha was prince of India but thats not true he was born in lumbini(Nepal).so could you please notify if..."Buddha was born in Nepal"
It is said that Buddha was an Indian prince because Nepal was a part of India then. As was Pakistan and Bangladesh a few years back. Besides Buddha's enlightenment, his first sermon, his leaving his body, all took place in the current geography of India. Just because of India getting divided in 1947 and making mohenjo daro a part of Pakistan now does not mean that this ancient civilization was Pakistani. It was and it is very much Indian. Thanks for sharing such meaningful information. He was a prince, he left his kingdom and went in search of truth at an early age when he encountered an events while traveling which made him realise that price or beggar, strong or weak, young or old, whatever the case on cannot escape the inevitable death. If everyone is born to die what is the truth of our birth, why are we born. With this in mind he left his kingdom and went in search of knowledge and got enlightened under a bodhi vruksh.